I needed a tech fix today. Some people have particular vices they turn to when the time comes – thankfully for me it is some techie thing, which is not so bad in the big picture (compared to other vices…). 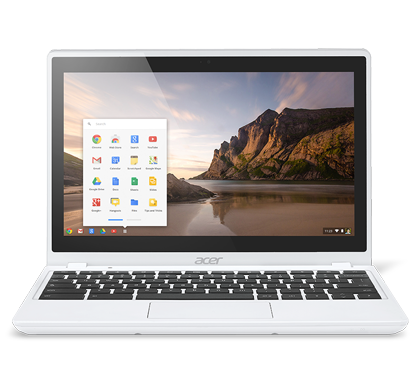 What satisfied my need is a nifty Acer C720P Touch Chromeook. I’ve been contemplating a Chromebook for a while now, and decided to pull the trigger. The nice thing is that for most Chromebooks, the trigger is not too big to pull (financially, that is). On first startup, I have been impressed. You have to login to a Google account to get started, and it is easy to do. As soon as I logged in, all my “stuff” was right there. The feel of the keyboard is a bit mushy for my preference in typing, but we’ll see how that plays out in the longer term. I usually like the feel of firm, responsive keys. I purposely paid a little extra for a touch screen – this concept fascinates me. This model does not fold flat and inverted with the keyboard underneath as if it is a flat tablet, but the touch screen is a nice extra. I wonder how much I will actually use this feature – more to come on this. The Chromebook is extremely light, and still firm to hold. The touchpad seems very responsive, and there are 2 USB ports and an HDMI port for external video. All seem like nice-to-haves. Again, only time will tell. I am looking forward to pushing the Chromebook to its limits!